Knickernappies Featured Retailer of the Week is...Mountaintop Tribe's Natural Family Supplies! Today's Featured Retailer Spotlight is on Mountain Top Tribe's Natural Family Supplies! We are the Beals, otherwise known as Mountaintop Tribe. We call ourselves that because we live in Alma, Colorado - the town with the highest elevation in North America. We're way up in the Rockies, and even with the possibility of snow every month of the year, we love it here. Jeremiah and I have been married for 10 years. We have three kiddos: Faith is eight years old, Georgia is six and Holden is nine months and happily an exclusively cloth diapered baby. Jeremiah is a custom furniture maker using re-purposed, reclaimed lumber and I am a stay at home, homeschooling mother and small business owner. How'd you get started cloth diapering and what made you decide to open your own business? When we found out we were going to have our third child, I was really excited about the idea of cloth diapering. It had been five years since I'd had a baby, and in that time, I had started to see so many of my friends using cloth. I loved the idea of it for the obvious reasons: It is the most environmentally friendly way of diapering, the most cost-effective, and the best for baby's bottom! I did a lot of research on cloth diapers and felt pretty confident and ambitious in the beginning. I sewed up a batch of small, fitted diapers and they worked for awhile, but when it was time to size up, I found that I didn't have time to invest in the process... I was busy homeschooling, caring for my baby, and just keeping up with all of our other family activities. I started trying out all of the different types of cloth diapers and brands that I had been reading about since the early part of my pregnancy. I had so much fun learning what I liked, and what worked best. It became very important to me that I use diapers made in the USA, and that they be of the highest quality. I started to develop a passion for cloth diapering! I eventually came to feel like a bit of an "expert" and wanted to share what I had learned with other parents up here in the mountains. That was what initially started us on the road to opening our own little shop. Most of the small mountain communities up here are too small to independently support their own natural parenting shops, which means that if a person wants to see, feel or try a product, they have to buy it online sight unseen... Jeremiah had the great idea that we should make our shop "mobile" and start touring around the mountains, bringing the products to the folks who otherwise wouldn't have the opportunity to "try before buying". I thought it was a great idea too, and started investing my bits and pieces of free time into making our vision a reality. We also decided to not just limit our shop to cloth diapers, but to offer all sorts of natural products to folks who really were looking for ways to "green" up and to better care for the environment and themselves. Thus, NaturalFamilySupplies.com was born! What I like best about being involved in the cloth diapering industry is being able to share what I have learned with new moms or moms new to cloth diapering. I feel like I have a good grasp on the "how to's" of it all, and what the best products on the market are. We have had such great personal success with Knickernappies! I love to spread the word and show others how easy, affordable and earth friendly cloth diapering is. My favorite Knickernappies product is the OneSize diaper with the LoopyDo insert! Holden can wear one overnight (he's a fairly heavy-wetter) and wake up in the morning feeling dry! I know he's comfy and cozy all night in his Knickernappies. I am also constantly amazed by how well these diapers wash up! We do not have one stain, and it's not because I'm diligent about keeping them stain-free! These diapers just come miraculously clean! I like to tell everyone I know that is interested in cloth diapering that they will not be disappointed in the quality of Knickernappies diapers. What's your one must-have cloth diapering accessory? Cloth diapering would not be nearly as enjoyable without our diaper sprayer that hooks up to the toilet! I can't imagine how else I would rinse off messy diapers before putting them through the laundry. It didn't matter much in the early months. Newborn messy is nothing compared to solid-food-eater messy. The diaper sprayer makes the most unattractive part of cloth diapering not so bad! If you could give one bit of advice to a mom new to cloth diapering what would it be? My advice would be to talk to other cloth diapering parents who have some experience under their belts. Ask around to find out what brands are working for others, and what methods of diaper washing works! There are so many options and opinions out there - so it's good to poll the folks that you already know, and then find a way to get your hands on different types and different brands! Don't sell yourself short by buying one type/brand of cloth diaper online. Discover for yourself, through many methods, what is going to work best for your family and your precious babe! 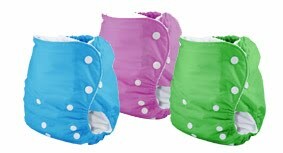 We currently have all colors of Knickernappies OneSize Diapers in-stock, in both microfiber and LoopyDo inserts! At this time, purchase 6 Knickernappies Diapers and receive the 7th free! Add 7 seven diapers to your cart and upon check out, use the discount code:"Knick". Offer is good for one "OneSize" Diaper with microfiber insert! Want to stay connected with Mountain Top Tribe's store? Utilize the links below! This is a wonderful story of a dedicated mother who is sharing her experience in a very enlightening way! To find such a niche for a online business is just amazing! I wish her and her family all the best with this wonderful business endeavour!